Will Thousands of East Bay Patients, Workers Lose Coverage, Jobs Due To Trump's 'Obamacare' Repeal? In Alameda County alone, the repeal could result in 6,000 lost jobs. 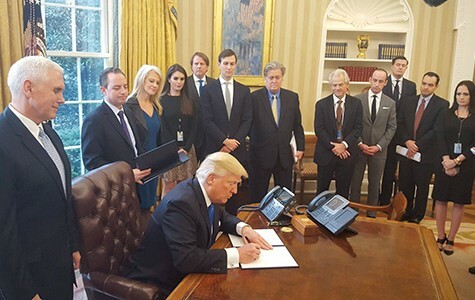 President Trump signs executive orders in January. Workers, patients, and experts worry about the blowback from an Affordable Care Act repeal. John Cameron spent nearly a quarter of a century working with concrete. Every day, the self-employed Dublin man held the heavy hose as wet concrete poured out, and later loaded them up at the end of a job. "Sometimes, I'd do three different jobs a day," he remembered. All this took a toll on his body. About 12 years ago, he began experiencing deep pain in his hips. He'd often spend up to four hours on the couch after work, with stabbing pain in his hips. X-rays confirmed severe osteoarthritis — and that he'd eventually need two total hip replacements. The 52-year-old and his wife, Colleen, had been paying $1,200 a month for health insurance, but the premium proved too costly, so last spring they switched to a less-comprehensive $350-a-month plan. But when it came time to get estimates for surgery, the Camerons found their insurance would only cover $2,000 of the $60,000 — for each hip. John reached a crossroad: go on disability for the rest of his life, or risk a debt he may never be able to pay off. However, Colleen met an agent for Covered California, while she was canvassing for Bernie Sanders. They ended up getting a Kaiser Permanente plan, for $82 a month, which covered John's surgeries. The first one is scheduled for February 22. 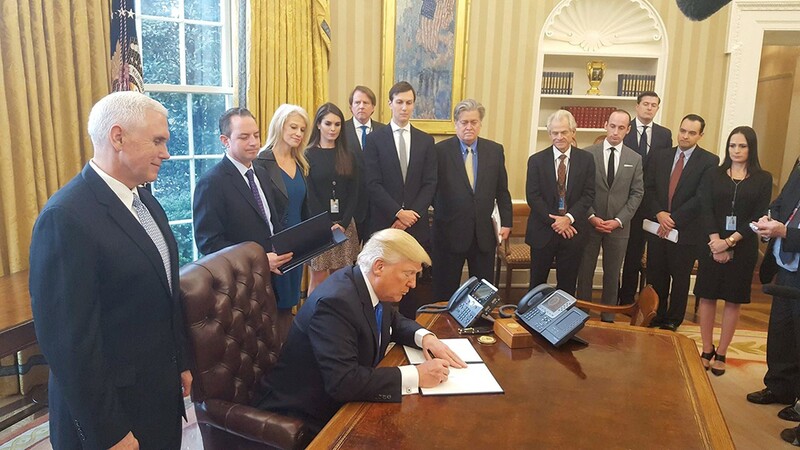 The timing is right, because President Trump's recent executive order regarding "Obamacare" would mean no new hips. On his first day as president, Trump stripped the ACA of its teeth, part of Republican's "repeal and replace" strategy. While the executive order is vague, some feel it is the beginning of the end for the ACA. But here in the East Bay, repealing the landmark health-care law brings with it a real cost to patients and workers. John's story is far from unique. Since the ACA was enacted in 2010, more than 3.8 million Californians — or 10 percent of the state's population — gained health insurance, according to the U.S. Department of Health and Human Services. Rep. Eric Swalwell, the Democrat Congressman from Dublin, recently invited John to share his story at a press conference after Trump's executive order. John is an example of how health care costs, as they stand, can crush individuals, families, and businesses. Swalwell said his office has been inundated with calls and emails from people like him who have "dodged debt, disability or death" thanks to the ACA. "To repeal the law without a valid alternative means kicking millions like John out of their health insurance, meaning certain financial ruin, illness and death for many. It's not acceptable in a civilized society," Swalwell said in a statement to the Express. James Scullary, a spokesperson for Covered California, said cases like John's were common before the ACA was enacted. Now, with Trump's order, many things are in limbo. The Congressional Budget Office estimates 18 million people nationwide would lose their health insurance the first year the ACA would be repealed. That would increase to 32 million by 2026. California is at risk of losing $20 billion in federal funds if the ACA is repealed. Under the ACA, California established its own state-based marketplace, which dictates what insurance companies can offer plans, premiums, and benefits. While open enrollment for the ACA and Covered California ended on January 31, Scullary and others are waiting to see what's next after Trump's order. "It's hard for us to react to something when you don't know what you're reacting to," he said. "With a lot of moving parts out there, it's very complicated. The Affordable Care Act is woven into so many different parts of health care." For instance, also at risk are people under the Medi-Cal program, the state's low-income health program. "Anything that affects the Affordable Care Act would affect that population," Scullary said of patients using Medi-Cal. In a December report, the UC Berkley Labor Center examined the potential impact of an ACA repeal without any replacement. Using economic-impact software, researchers estimate $20 billion on lost gross domestic product, and $1.5 billion in lost state and local tax revenues. "The ACA not only significantly expanded access to health insurance in California, but it also provided economic stimulus at a time when the state was still recovering from the Great Recession," the report stated. Besides economic loss, an estimated 209,000 jobs in California are expected to disappear, as well. In Alameda County alone, the repeal could result in 6,000 lost jobs. Laurel Lucia, one of the authors on that report, said 135,000 of those jobs in the state will be primarily union or middle-class jobs in the health-care industry. Others would be a trickle-down effect of those people losing their jobs. Without a replacement to the ACA on the horizon, forecasters don't know what the future holds. "We couldn't model for a replacement plan, because there isn't a consensus on what that would have looked like," Lucia said. Lucia says the repeal conflicts with campaign promises. "These two issues are far more connected than people realize," Lucia said. "The economic losses greatly outweigh the economic gains." And these estimates do not factor in workers who would need to leave the job market, due to disability — workers like John Cameron. After his surgeries, he expects to continue working. At least he won't have a gigantic medical bill looming over his head. "I feel like I don't have to be stuck paying these bills for the rest of my life," John said. "It's just been a lifesaver, really," Colleen said.